Better drafting and detailing, for free. If you are an AutoCAD LT user, DoubleCAD XT will immediately feel familiar. Familiar menu, menu items, tools, icons, command line, keystrokes... even a familiar intelligent cursor. But — maybe more importantly — you will feel welcomed improvements as well, like contemporary colors and icons for a modern look and feel. There are lots of free .DWG viewers on the market — like Autodesk® DWG TrueView™ and Design Review, Informative Graphics® brava!® Free DWG Viewer, and SolidWorks' eDrawings viewer. 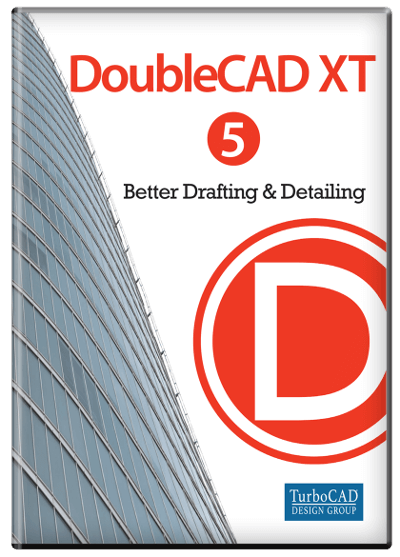 DoubleCAD XT is more than a free .DWG viewer... it is a full-powered CAD application that lets you open a variety of file formats and, most importantly, edit those files. DoubleCAD XT even has a smaller footprint than the Autodesk products, too. Effective drafting and detailing are the heart of CAD productivity. DoubleCAD XT employs a large selection of line, arc, curve, and spline tools, so that no matter the situation you have got the right tool for the job. When used with DoubleCAD XT snaps, modification tools, and drawing aids, you will be able to quickly draft and document your designs with outstanding flexibility. Powerful tools such as custom brush styles, transparencies, and smart dimensions also greatly enhance detailing. No need to buy a separate hatch pattern creator, DoubleCAD XT even comes with its own. Surprise, DoubleCAD XT has the features you've been waiting for... things like transparent fills, draw order by layer, explodable viewports, bezier curves, flatten 3D to 2D views, hatch pattern editor, advanced polyline editing, automatically scale units between drawings, parametric variable palette, embed/bind image files in a drawing, input multiple unit types on-the-fly, and more. The stuff you want... today... for free. Architectural users will like intelligent self-healing walls that are ADT compatible (a considerable improvement over the AutoCAD LT double-line tool). Any block can be used as a custom architectural element that will automatically align to self-healing walls when inserted. Advanced handle-based editing of selected objects gives you instant access to sizing, scaling, moving, rotating, and positioning without selecting multiple tools. Brush styles, including hatch patterns, can be created using bitmaps, transparency, and full color. Hatch patterns can even be used in layered combination for a better expression of your design concept. DoubleCAD XT also has productivity tools not found in AutoCAD LT that can accelerate the drawing experience. DoubleCAD XT is .DWG compatible, as you would expect. What you may not expect is a DoubleCAD .DWG file, containing ADT-compatible walls and self-aligning blocks, can be brought into AutoCAD or AutoCAD LT and designs retain their self-healing properties. This intelligent behavior can save hours of adjustment and iteration within AutoCAD products and is yet another reason why DoubleCAD XT a great AutoCAD companion. With all the time and effort you will save, DoubleCAD XT is a no-brainer way to kick-start an AutoCAD project. You may not expect DoubleCAD XT to enhance workflow with Google SketchUp, either, but it will. DoubleCAD lets you develop construction documents quickly from SketchUp models. AutoCAD and AutoCAD LT don't come close. We're trying to shake up the CAD world. We won't do that unless we have something special. We're not constraining printing, saving, file sizes... we're not including untimely time-outs... we're not even constraining the software license — our free DoubleCAD XT can be used for unlimited personal and commercial use. Our hope is that as you need even more power, you'll consider upgrading to our enhanced DoubleCAD XT Pro product or DoubleCAD plug-ins as available. DoubleCAD XT Pro is a great companion to AutoCAD and an excellent drafting complement to popular mechanical design package such as SolidWorks, Pro/ENGINEER®, and Solid Edge. DoubleCAD XT is based on IMSI/Design's award-winning CAD code with over two million copies sold worldwide — no wonder it received CNET Editors' Review highest 5-Star rating and is Download.com's most downloaded free CAD application. DoubleCAD XT: A great companion to AutoCAD in .DWG shops... the CAD of choice for Google SketchUp users... and the #1 alternative to AutoCAD LT in the marketplace. Pentium® IV Processor; Microsoft ® Windows® XP with 512 MB RAM; Windows Vista or Windows 7 with 1024 MB RAM; 300 MB of free hard disk space; 64+ MB of swap space; Super VGA (1024 x 768) display; High Color (16 bit) graphics support; 4X DVD-ROM drive.